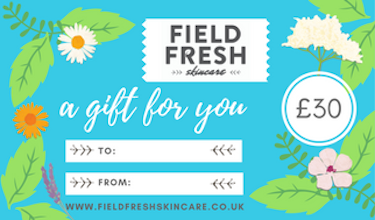 Gift vouchers are redeemable against any Field Fresh Skincare product or experience. When you know someone who would love the experience of Blend It Yourself, but you’re not sure which would be their favourite kit, a gift voucher is perfect. Show your support for their creativity by gifting them choice. Gift vouchers are wonderful to celebrate birthdays, Christmas, Mothering Sunday, as a teacher’s gift, for an expectant Mum, to congratulate on exam success or for a student away from home … Make It Easy with a gift voucher. Gift vouchers can be sent as an email to you or your chosen recipient. 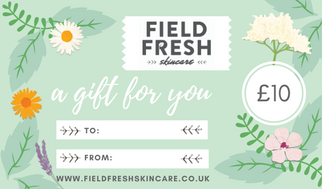 You’ll receive a pdf with the email so you can print a beautiful gift voucher to hand over in person. Gift vouchers are valid for 12 months from day of issue. They are redeemable online against any product or experience by simply entering the voucher code during the checkout process. 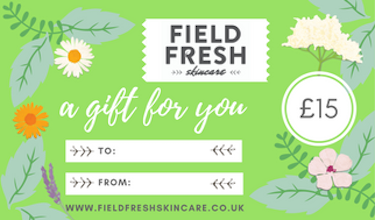 You may also present your gift voucher in person when visiting a Field Fresh Skincare stall, party or workshop.